These gorgeous lamps may look as if they’ve been excavated from ancient crystal caves, but they are in fact the product of an imaginative assemblage of recycled and eco-friendly materials. 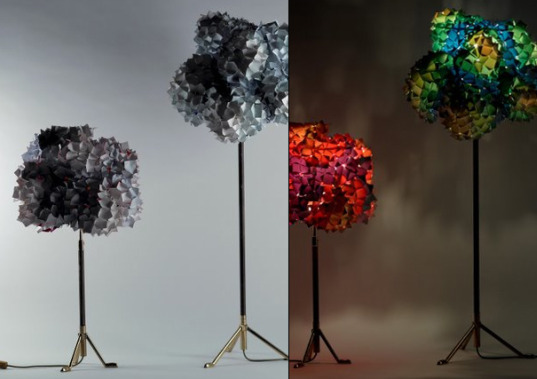 Created by a collective of designers based in Hong Kong, the ‘Living Pixels‘ lamp takes antique and junk light stands, low-energy bulbs, and a diffuser made up of recycled banners and turns them into a colorful feast for the eyes. But here’s the kicker — as vibrant as these lamps may appear to be in their luminescent state, when turned off, they’re actually a nondescript white! Each diffuser, or lampshade, has been cut and sewn together from discarded banners collected from a variety of sources around the local area. Printed on the interior and white on the outside, the range of available materials and the mode of construction employed for each piece creates an incredible and varied diffusion of light. While not yet mass produced — each lamp is a one-off — the Living Pixels lamp has the potential to become a wonderful green addition to any space, able to provide an unassuming-yet-stunning source of light with the intrinsic power to ‘WOW’ with just a flip of the switch. These gorgeous lamps may look as if they’ve been excavated from ancient crystal caves, but they are in fact the product of an imaginative assemblage of recycled and eco-friendly materials. 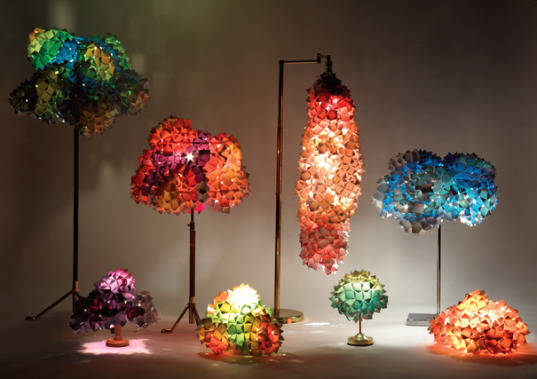 Created by a collective of designers based in Hong Kong, the 'Living Pixels' lamp takes antique and junk light stands, low-energy bulbs, and a diffuser made up of recycled banners and turns them into a colorful feast for the eyes. But here’s the kicker -- as vibrant as these lamps may appear to be in their luminescent state, when turned off, they’re actually a nondescript white!